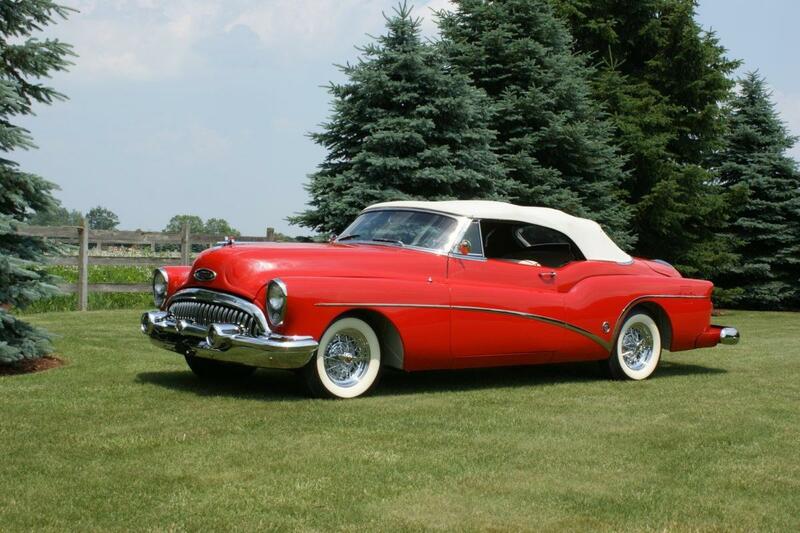 Buick celebrated its 50th anniversary in 1953 by putting a Motorama show car into actual production. Named Skylark, this limited-edition was an ultra-luxury, full-size sports convertible. 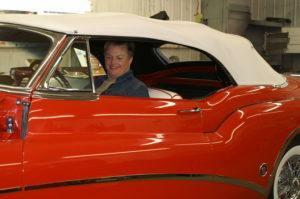 It was a Harley Earl creation all the way. This stunning automobile was based on Buick’s experimental sports car, the XP-300, which created a huge amount of excitement in 1952. With so many customers wanting to place orders for an XP-300, Buick banked on that interest and built the Skylark. The 1953 Skylark was one of the most expensive cars in Buick’s lineup and in the collector car market; ownership of a Skylark is considered an acquisition of remarkable historic significance. The magnificent example on display in Kens collection is #38 of 1690 produced in an “off production” area of the GM plant in Flint Michigan. It was possibly built either the 2nd or 3rd day of full Skylark production. Bill Oldenburg of Galena, IL started the restoration intending the car to be his personal car for the occasional cruise night and some top down driving thru historic downtown Galena. However, once he completed the concours level restoration he knew it was too perfect to ever drive regularly. Knowing that Ken Nagel had a collection full of number 1 cars that are preserved and well cared for, he offered it to Ken for sale. Ken bought the car and placed it in his collection in 2006. Offered only as a convertible and based on the Roadmaster drivetrain, these were the cars of the rich and famous; Milton Berle, Alfred Hitchcock, Bob Hope and Jackie Gleason were some of the better-known celebrities that drove them. 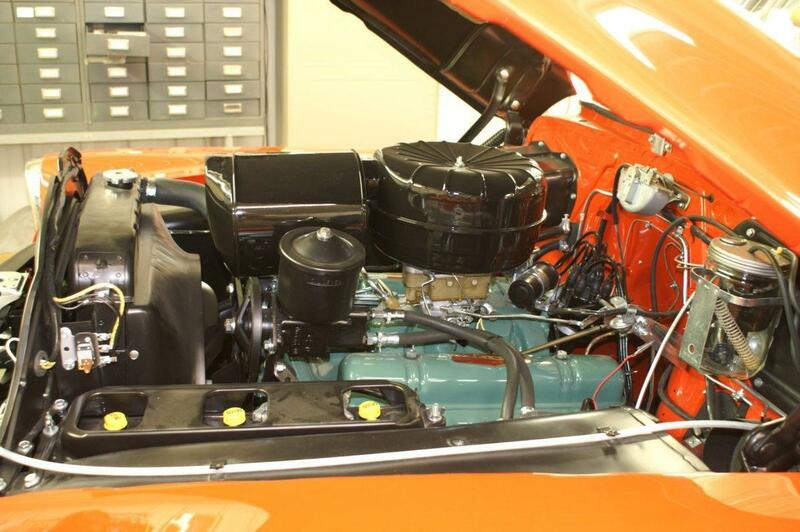 Much of the body and engine work was done by hand thus accounting for the $5,000 price tag. The Skylark’s exclusive nature was such that Buick engraved the original owner’s name in silver on the tripartite medallion in the horn button. Although the Skylark was nearly twice the price of a regular Buick convertible its sales totaled 1,690 units and at $5,000 a copy, was by far the most expensive Buick. 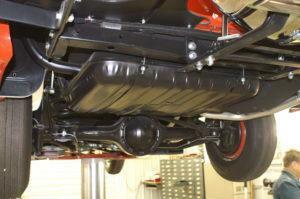 With the convertible top in the up position, the Skylark stands less than five feet tall. 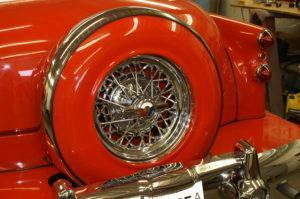 The low slung appearance was achieved by lowering seat frames, steering column and chopping the windshield 4 inches. 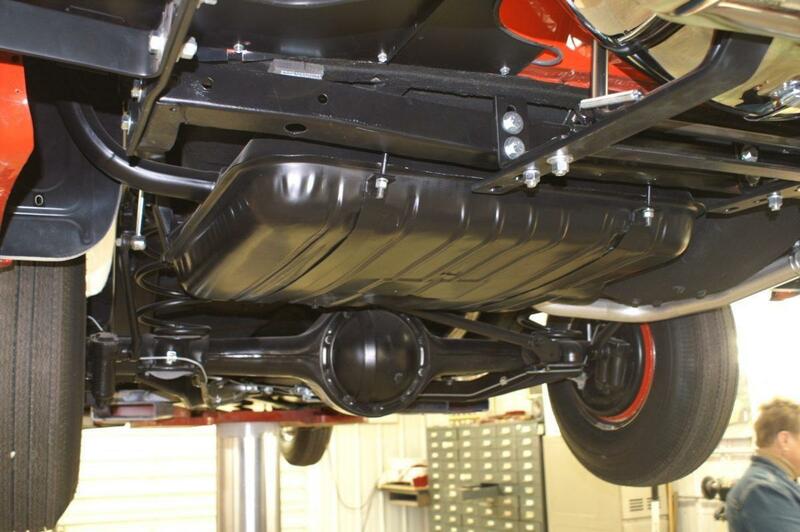 The stampings for the front fenders, rear fenders, outer doors, and a portion of the convertible tub were unique to the Skylark. Other body panels were mostly hand-modified Roadmaster panels. The doors were sectioned in Flint and then re-welded to create the low, sweeping bodyline. This also meant that all the side glass was special to the Skylark. The “Ventiports” were shaved off the front fenders to keep the lines clean; the wheel wells opened up and painted red or white to highlight the chrome wire wheels. 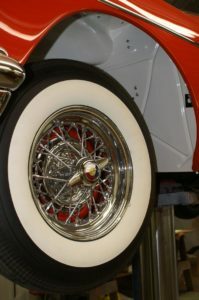 A two-way chromed “sweepspear” began at the front wheels and dipped sharply ahead of the rear ones before “jumping” over them and ending near twin “bullet” taillights on each rear fender. While the exterior appearance was certainly visually stunning the interior was no less than extraordinary. The interior appointments are luxurious in keeping with the $5,000 price tag. In addition to sumptuous leather seats, carpets and door panels, power windows were standard. The leather seats were soft-tanned cowhide. The front bench seat moved forward automatically when the front seatback was tilted to gain access to the rear compartment. The Selectronic radio with a power antenna is activated by a floor mounted button on the driver side. The convertible top, seats and power windows are all hydraulically operated. 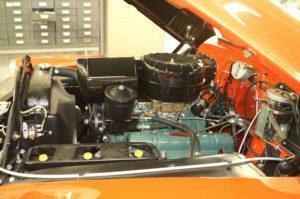 New for 1953, too, was the use of a 12-volt electrical system. An all-new “Fireball” 322-cu.in. 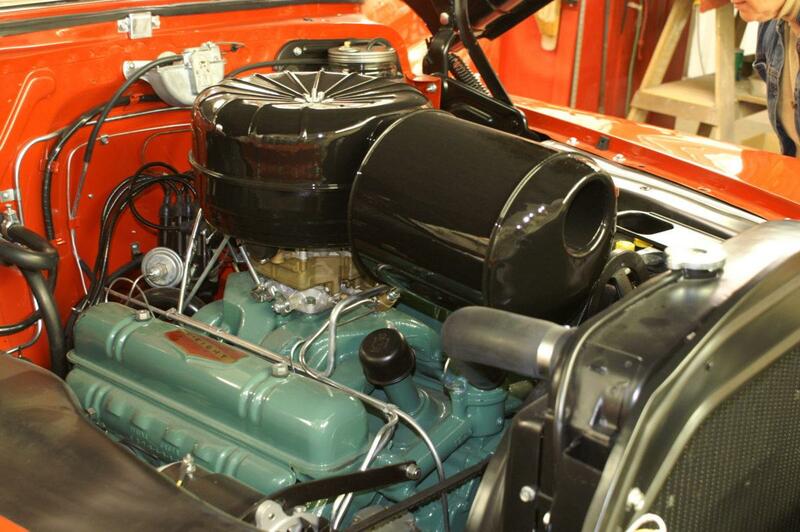 V-8 producing 188 horsepower was the only engine available for the Skylark. With a bore and stroke of 4.0 x 3.2 inches, these were well-built engines featured specially designed dome-shaped cylinder heads. The cylinder heads were engineered to concentrate the fuel charge at the precise point where its explosive force would most effectively push the piston down its bore. 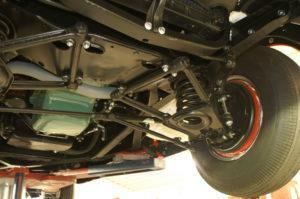 Each piston was custom-fitted to its cylinder, which ensured longer life and quieter operation. Internally, the crankshaft featured cam-ground balancing of the counterweights. The T-Type intake manifold was another unique feature; it distributed fuel to each cylinder more evenly than the conventional Y-Type arrangement. The Skylark could cruise effortlessly all day at 100 mph. There were two different brands of four-barrel carburetors used: a Stromberg 4AUV-267, or a Carter WCFB-996S. 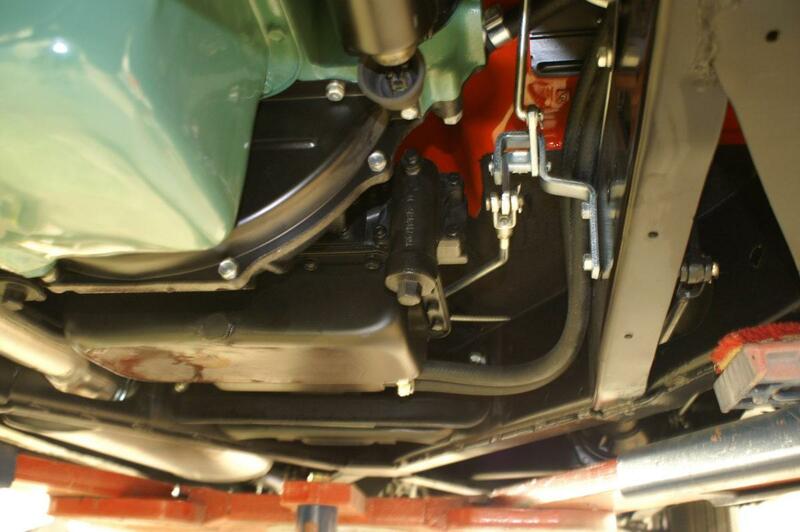 The only transmission used in the Skylark was a Twin Turbine Dynaflow. The Twin Turbine debuted in 1953 and used a four-element torque converter featuring two turbines interconnected through a planetary gear set. 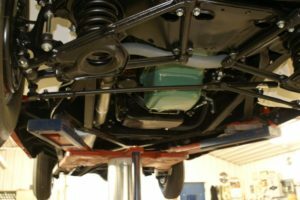 This setup gave a more positive connection between the engine and the driveshaft making for very durable and reliable gearboxes that rarely need any major repairs. With an anti-roll bar up front, coil springs at all four corners and hydraulic lever-arm-type shock absorbers, the suspension delivered superb ride and handling. 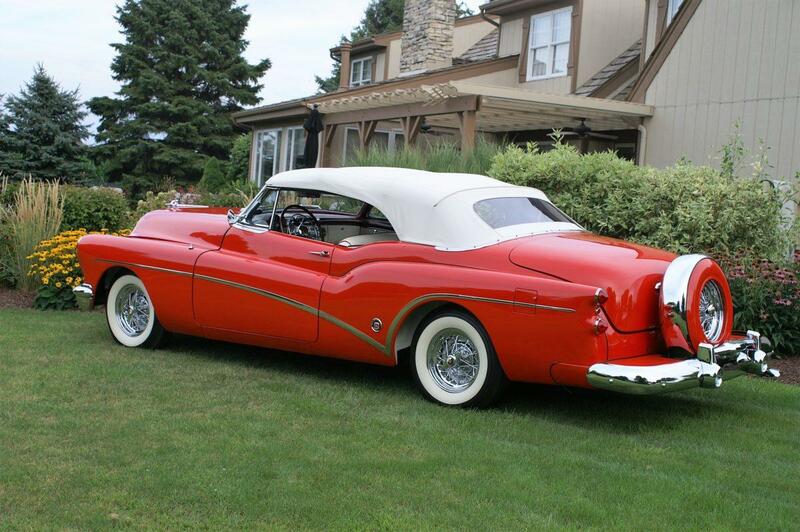 Although it was only produced in limited numbers the 1953 Skylark ushered in the era of personal sport luxury cars that would eventually be copied by almost every American manufacturer for the next 20 years. Skylark was discontinued in 1954 with just 836 copies made. No collection of significant 50’s and 60’s automobiles would be complete without one.